In The Ship of Fools " Bosch is imagining that the whole of mankind is voyaging through the seas of time on a ship, a small ship, that is representative of humanity. Sadly, every one of the representatives is a fool. This is how we live, says Bosch--we eat, dring, flirt, cheat, play silly games, pursue unattainable objectives. Meanwhile our ship drifts aimlessly and we never reach the harbour. The fools are not the irreligious, since promiment among them are a monk and a nun, but they are all those who live ``in stupidity''. Bosch laughs, and it is sad laugh. Which one of us does not sail in the wretched discomfort of the ship of human folly? Eccentric and secret genius that he was, Bosch not only moved the heart but scandalized it into full awareness. The sinister and monstrous things that Bosch brought forth are the hidden creatures of our inward self-love: he externalizes the ugliness within, and so his misshapen demons have an effect beyond curiosity. We feel a hateful kinship with them. 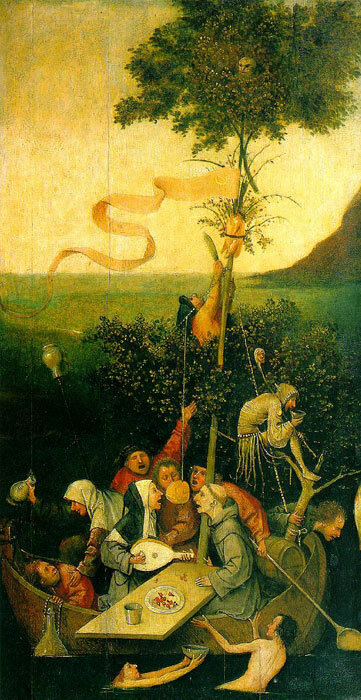 "The Ship of Fools" by Bosch is not about other people, it is about us. SPECIAL NOTE : The painter will make the reproduction as close to the original oil painting as possible. If you want your painting to alter from this likeness, please email us and " The Ship of Fools, 1490-1500 " will be reproduced according to your special requirements.